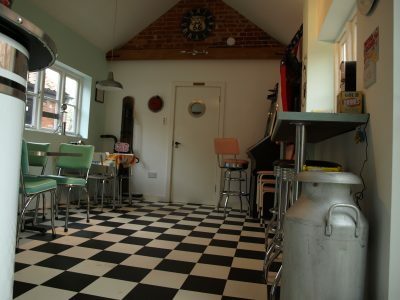 For private hire, parties, cookery courses and more! Ice-Cream Sundae – Book the diner for an ice-cream sundae feast to share, using Ronaldos local Norfolk Ice-cream, treats, home-made sauces and bakes - minimum 4 @ £6.50 per person including a drink - pre-booking only / please request details on booking. 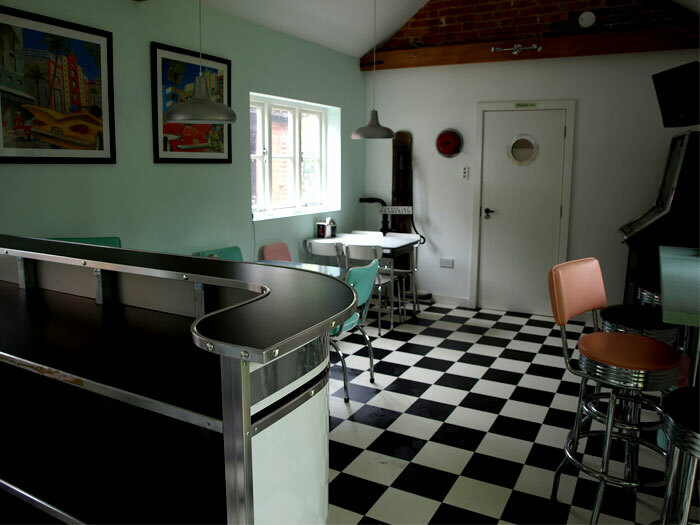 Want to Chill out in the diner - maybe bring in some treats, watch a dvd - holiday makers can hire the diner for £15 an hour or £22 for 2 hours (resident rate excluding catering equipment / price per barn). Information in your guest books or contact me for more details. Ya, all have a nice day now! Ice-Cream Sundae Party - Diner Hire for up to 16, choice of 3 Ronaldos ice-creams, choice of home-bake (inc. waffles, brownies, fudge cake, sticky toffee pud) and tons of toppings, fruits, sauces, whipped cream and yummys - plus coffee or home-made lemonade. Get it on and make something delicious and enjoy - spoons at the ready. £10.00 per person minimum 10 plus £8.50 p.p up to 16. The prefect surprise treat including private diner hire up to 2 hours. 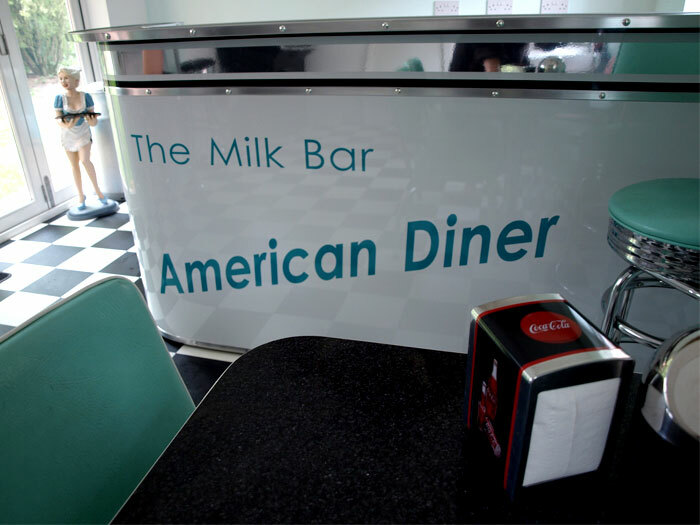 American Diner Classics Cookery Course for Adults - See Cookery page for Group cookery courses, go Large and Adult or Children's Parties. 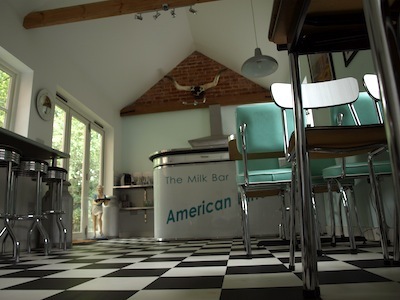 Why an American Diner in a Jacobean Farm house? From the second I walked in to what was known on the property details as "the Studio" I thought this room would make a magnificent American Diner. It was the worst room in the house, totally damp & dirky, ivy crawling through the windows, the french doors were glass-less and rotten to the core - the roof pine clad was green with rot and letting in water everywhere - you could see the sky when you looked up - but I loved that one day it would be my little diner. When we ripped everything out we found an 1800's metal water pump in the corner - we were told that Ivy Morter the last tenant farmer had made all her cheese and yogurt in that room but that's not only why we called it "The Milk Bar" me and my hubby met at The milk bar, a club in London back in the 90's. My mum started my fascination with American Food, she dreamed of going to America as a little girl and eventually she saved up enough money from singing (Renny Lee - New Faces 76) to take us all there - as a 11 year old girl I loved the diners and the service, the burgers, the hot fudge sundaes, the milk shakes and fries and every day the waitress would say "Have a nice day" - and mean it!!! I love cooking American food - its so bad for you its good and freshly made its even better. The Fries have to be cut just right with the right potato and the mince freshly ground for the perfect burger patty, crisp from the griddle on the outside and juicy in the middle - oozing with local cheese and served in a custom made bun. But don't take my word for it get your self booked on to one of my American Cookery courses ith some pals and find out how to cook the perfect burger with ice cubes!!! !